Lenin Lives . . . Comments Off on Lenin Lives . . .
April 24, 2015 marks the 145th anniversary of the birth of Vladimir Lenin, founder of the Soviet Union. After Lenin’s death, his body was preserved and put on display. It is open to the public to this day. 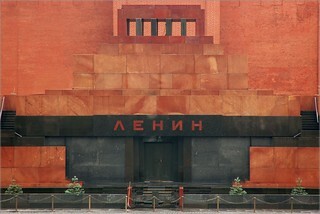 In preparation for the special occasion, the Lenin Mausoleum located in Moscow’s Red Square was shut down. The hundred and forty-five year-old communist was due for a touch-up, having sustained ninety years of postmortem embalming procedures. Jeremy Hsu. “Lenin’s Body Improves with Age.” Scientific American, April 22, 2015. Accessed April 25, 2015. http://www.scientificamerican.com/article/lenin-s-body-improves-with-age1/. Alexei Yurchak. “Bodies of Lenin: “The Hidden Science of Communist Sovereignty.” Representations 129 (2015): 116-157.